This weekend marks the unofficial end of summer and today I have a super easy way for you to elevate your cocktail game for the occasion: strawberry infused vodka. It’s super easy and requires 2 ingredients–one of which would otherwise be trash. It’s also really, really pretty. I love strawberries and I think I felt a little deprived in NY by the extremely short season they have there. Cut to our move to California, where strawberries are available at the farmers market for a big chunk of the year and I still can’t get enough. I still gorge myself on them. I buy 3 pints of them almost every week. I hull them all at once, macerate them in a little sugar and a generous does lemon juice, or I make Strawberries in Wine. They keep this way pretty well for the week. At some point I started to wonder about all the little strawberry tops that were getting tossed out. Then I came up with the brilliant idea to infuse our own vodka. It couldn’t be easier (so easy it’s pretty much a non recipe) and infuses the flavor in the vodka so intensely that it almost seems like it must be artificial. Of course you can infuse vodka with any number of fruit flavors, but I like this in particular since you’d probably be throwing the tops away anyways. Strawberry tops - We usually use the tops from at least 3 pints of strawberries, but the more you use, the more intense the flavor will be. If you don’t have enough to begin with, store tops in the freezer until you’ve collected enough. 1. Separate the tops of strawberries, making sure to remove the majority of the green leaves, as you hull strawberries. 2. Put the tops in a large container and cover with vodka. Add as much vodka will fit in the container. 3. Set aside the vodka to infuse for at least 24 hours to a few days. The color will eventually leach out of the strawberries and into the vodka. 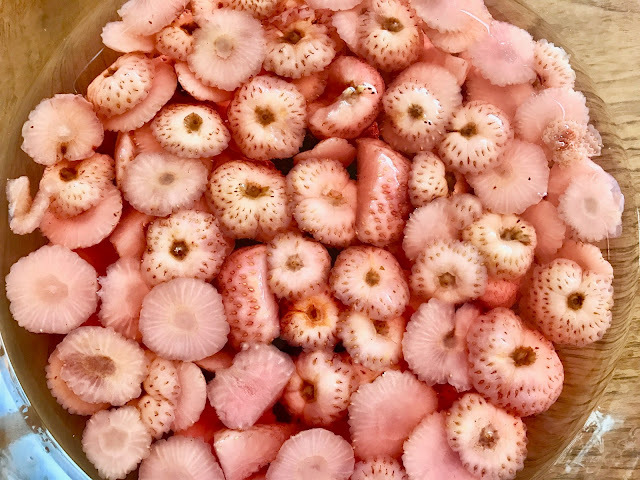 Once the vodka is deeply colored and flavored, strain out the strawberry tops and transfer to a bottle or other container for storage. No need to refrigerate. For more ideas on how to turn leftover bits into fabulous drink, check out this Bits & Pieces Cocktail.